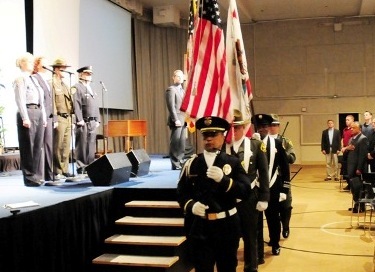 Christian Law Enforcement Fellowship (CLEF) is a faith-based non-denominational Christian non-profit Para-church organization committed to a Biblically oriented outreach to the law enforcement community of San Diego County. We strive to do this through a variety of approaches as the Holy Spirit leads with opportunity, insight, answer to prayer and spiritual burden driven by personal involvement with law enforcement agencies and personnel. We believe the Lord established this ministry, and provides for it as He sees fit, altogether spiritually, physically, financially, and materially. We strive to be faithful by God’s Holy and inspired written Word, profitable for our teaching, reproof, correction and training in righteousness that we may present each man adequate and equipped for every good work. And certainly the goal of our instruction is love from a pure heart, a clear conscience and a sincere faith. Modern law enforcement is fraught with every manner of spiritual darkness and difficulty. Our society struggles with turmoil over fundamental issues of right and wrong, with Truth itself held suspect and compromised by moral relativism. Those in the law enforcement profession come face to face with the corruption of the evil within us all on a daily basis. To do their job well requires far more than what they have to draw from in themselves, and, spiritually, those who believe must look to the Lord for that adequacy. Law enforcement has been given the responsibility for moral leadership in the community, and as such, ethics, morality, a correct understanding of duty, compassion and a high regard for human dignity are all important factors in the decisions they must make every day to protect it. To be effective they must also safeguard their own inward character of fidelity with the moral virtue that both strengthens and preserves their ability to lead, and shields them from the onslaught of what they must lead against. Thus is it imperative that they be compelled by the Truth, and committed to the integrity of uprightness. Without a firm grip on the axioms of right and wrong that maintain a foundation for honor and rectitude, instead of providing stability, they fall to mischief, compromising the vanguard of the community’s defenses. It is the vision of CLEF to reflect to our brothers and sisters in this profession a heart for the Lord for wisdom, discernment, and a prudent, disciplined understanding of the Truth of God’s Word to accommodate their role as peace-keepers. All authority emanates from God, and an officer cannot effectively carry authority unless he is first aligned under and himself subject to God’s Authority, as such then able to exercise and administrate the lovingkindness, justice and righteousness that are the strength and security of any community. While not every officer is a believer as such, all men are subject to authority, and by example, leadership and counsel, we strive to impart a sense of personal accountability to maintain fidelity with the public trust by staying above reproach and striving for excellence in our calling as public servants. CLEF is administrated by three men who, by God’s calling, have made it their life’s work to serve the men and women in law enforcement with what they need spiritually and emotionally to carry out their commission. The strength of every officer’s resolve must come from within and based on the absolutes that govern all of life. CLEF was founded 20 years ago by Herb Smith, a former San Diego Police officer. Herb, born in San Diego in 1954, graduated from San Diego State with a B.S. in Criminal Justice Administration in 1977. He then joined the SDPD and served as a sworn officer for six years, working assignments in patrol, beach enforcement, tactical response, and four of those while a SWAT officer. In 1984 he sensed a call into full time Christian ministry and resigned from the department to study at Talbot Theological Seminary in La Mirada for three years. After receiving his Masters of Divinity, he returned to San Diego where he and his wife Debbie established CLEF under the auspices of Christians In Government. Herb serves as a Chaplain Coordinator for the San Diego Police Chaplain’s Program, as a Crisis Coordinator Chaplain for the Sheriff’s Department, and an on-call Chaplain for the District Attorney’s Peer Support Team. Herb also maintains outreach through officer Bible Study groups, and annual L.E. Prayer Breakfast (which also includes Fire Fighters and draws approximately 700 from various agencies and their command staffs), marital and pre-marital counseling, weddings, funerals and marriage retreats. Department involvement also involves ride-alongs, invocations for various department occasions (academy graduations, special ceremonies, annual community events) as well as dealing with various crisis situations where requested. Herb was ordained as a minister in 1993 through Christians In Government. Christians In Government was founded in 1974 in Los Angeles by the late Hubert Mitchell. Its purpose was from the beginning to serve as a ministry outreach to all government workers in public service in the metropolitan areas of L.A. It remains a Los Angeles-based evangelical, non-profit, non-denominational organization committed to helping Christian government workers in personal growth and effective witness on the job with their words and actions to introduce colleagues to the reality of Jesus Christ. It endeavors to assist Christians to meet with one another at regular times for devotional prayer, Bible study and other opportunities for spiritual growth and outreach. It also encourages the integration of faith with job responsibilities through the exercise of moral and ethical principles from Scripture as the standard for absolute truth. It advises and supports those seeking to establish prayer and study groups in their government workplace, and serves as a liaison for inter-group activities. In 1987, as Herb searched for organizational covering and accountability for an outreach ministry to law enforcement in San Diego, he contacted CIG to become an extended ministry under them. This was granted in September of that year, and CLEF has ministered under the Board of CIG ever since, reporting to them on a quarterly basis. Herb has been married to Debbie, who is also a Talbot graduate, since 1984, and home schooled their four children, Caleb (‘88), Nathan (‘90), Anna (‘93), and Christa (‘95). His life interests also include focused time with his family, guns and shooting, sometimes fishing, drinking tea, running, weight lifting, and shooting his and anyone else’s guns whenever time and opportunity allows. Dale Lowrimore joined efforts with Herb and CLEF/CIG in 2003, having served with Herb in a variety of law enforcement chaplain capacities since 1995. Joe Davis was made a third partner in the outreach of CLEF/CIG in 2004, also having worked with both Herb and Dale as a Sheriff’s Chaplain, and in his own right for several years prior as Chaplain for the San Diego Medical Examiner’s Office. It is the vision of CLEF to reflect to and encourage our brothers and sisters in this profession to seek the Lord for wisdom, discernment, and a prudent, disciplined understanding of the Truth of God’s Word to accommodate their role as peace-keepers. All authority emanates from God, and an officer cannot effectively carry authority unless he is first aligned under and himself subject to God’s Authority, as such then able to exercise and administrate the loving kindness, justice and righteousness that are the strength and security of any community. While not every officer is a believer as such, all men are subject to authority, and by example, leadership and counsel, we strive to impart a sense of personal accountability to maintain fidelity with the public trust by staying above reproach and striving for excellence in their calling as public servants. The responsibility of every Christian is to make the news of salvation known to as many living persons as possible (Mt.28:18-20). Retired Police Officer, Coronado Police Dept. Retired Commander, San Diego Sheriff’s Dept. We attempt to keep our events affordable in order to serve as many people as we can. This is made possible through the generous sponsorship of local businesses, and individuals, along with the service of many dedicated volunteers. Our CLEF Chaplains, on the other hand, rely on their financial support from individuals who are led by God to give. We have received inquiries on how individuals could support C.L.E.F. ministries and/or individual chaplains. It’s a pretty simple process. Two very helpful bits of information are: #1 which chaplain(s) receives credit for the donation; #2 the month the donation is for. If you pay bills online, the information needed is the same as for item #1 above. Since you don’t have an account #, this field can be used to indicate where the donation is directed, i.e. Smith, Lowrimore, Davis $100 Or Prayer Breakfast $100, etc. You may also use the PayPal option below. Any of the three options will result in a tax-deductible receipt for I.R.S. in January of the following year; however, the PayPal option will not include the portion of your donation that was retained by PayPal to cover their fees. Thank you for your support of our Christians in Government/ Christian Law Enforcement Fellowship ministries!